The emergence of novel structures during evolution is crucial for creating variation among organisms, but the underlying processes which lead to the emergence of evolutionary novelties are poorly understood. The gnathostome jaw joint is such a novelty, and the incorporation of bapx1 expression into the intermediate first pharyngeal arch may have played a major role in the evolution of this joint. Knockdown experiments revealed that loss of bapx1 function leads to the loss of the jaw joint, because Meckel’s cartilage and the palatoquadrate fuse during development. We used Xenopus laevis and Ambystoma mexicanum to further investigate the function of bapx1 in amphibians. Bapx1 expression levels were upregulated through the use of Ly-294,002 and we investigated the potential consequences of the enhanced bapx1 expression in amphibians to test the hypothesized joint inducing function of bapx1. We show that Ly-294,002 upregulates bapx1 expression in vivo. Additionally, ectopic mandibular arch derived cartilages develop after Ly-294,002 treatment. These ectopic cartilages are dorsoventrally oriented rods situated lateral to the palatoquadrate. The development of these additional cartilages did not change the muscular arrangement of mandibular arch-derived muscles. Development of additional mandibular cartilages is not unusual in larval anurans. 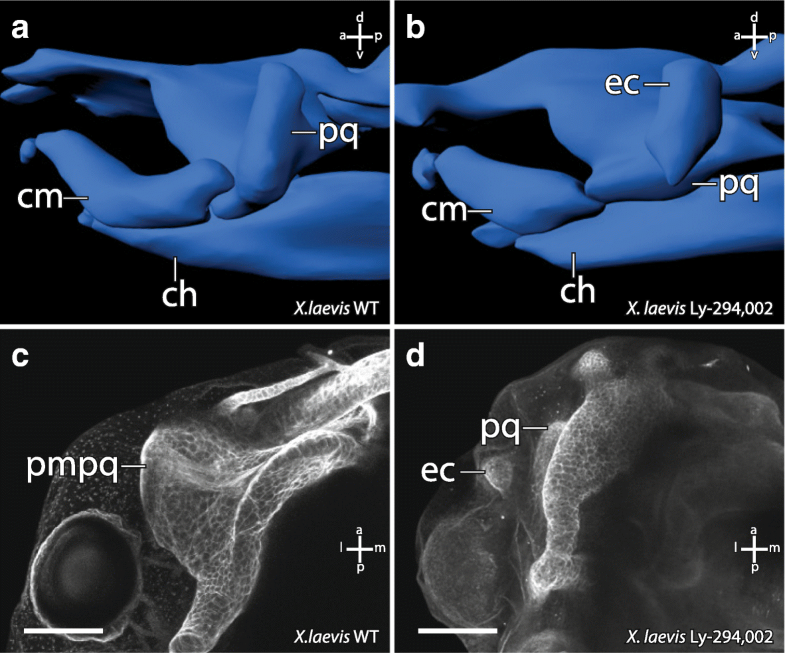 Therefore, changes in the bapx1 expression during evolution may have been the reason for the development of several additional cartilages in the larval anuran jaw. Furthermore, our observations imply a joint-promoting function of bapx1, which further substantiates its hypothetical role in the evolution of the gnathostome jaw joint. The acquisition and incorporation of novel skeletal structures into an existing skeletal environment is a process that can cause morphological diversification. How such evolutionary novelties arose during evolution and under which circumstances they arose is an important question in evo-devo research. An important example is the evolution of the gnathostome jaw and its skeletal diversification in different phyla. The jaw itself consists basically of a dorsal and a ventral element, which are connected by a distinct joint . Jaw evolution enables predation on large and motile prey and can therefore be seen as one of the central innovations in gnathostomes. The larval anuran jaw is distinct from those in other vertebrates. At the base of anurans two additional jaw structures, the rostralia, evolved. The suprarostral cartilage forms the anterior part of the upper jaw, whereas the infrarostral cartilage is part of the lower jaw and movable against Meckel’s cartilage via the intramandibular joint . 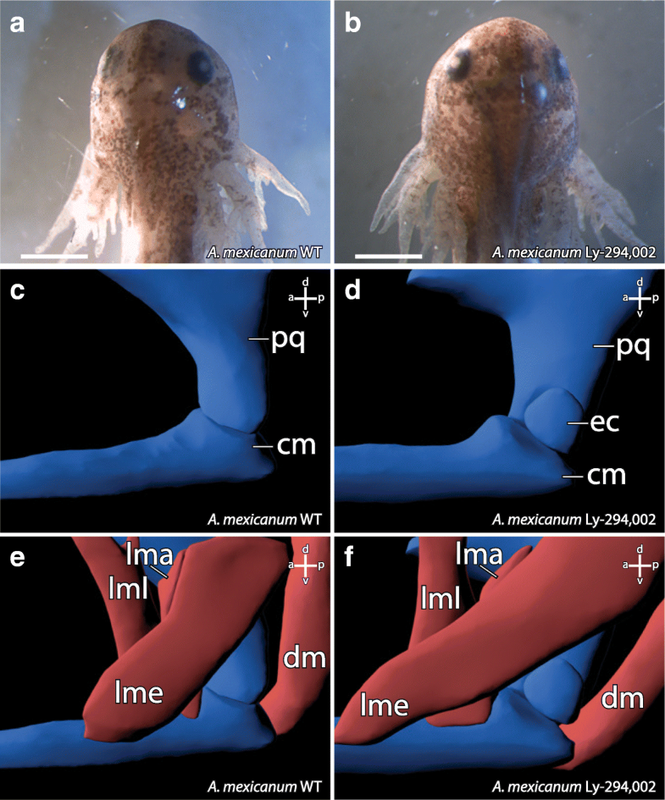 These two additional structures made possible the evolution of numerous different feeding modes in anuran tadpoles, which enabled the decoupling of larval and adult stages. The diverse feeding modes, which are based on the derived morphology, may be a contributing factor behind why anurans are the dominant recent amphibian group . During further evolution several anuran taxa evolved one or more additional cartilages within the larval jaw. Such adrostral cartilages are described in Heleophryne natalensis, Pelobates fuscus, Alytes obstetricans and Pelodytes punctatus, to just name a few species [4, 5]. 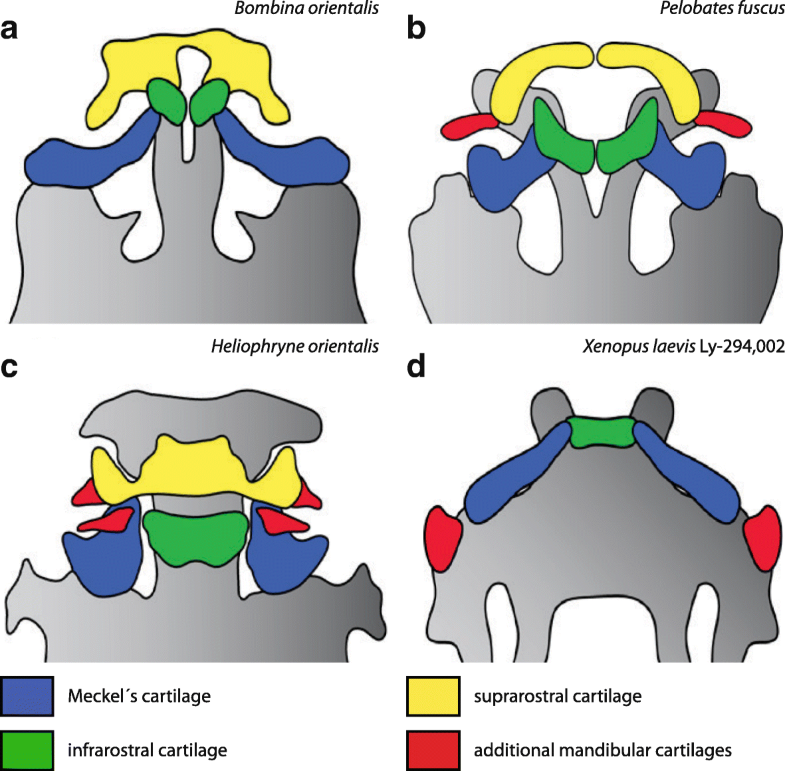 Three different mechanisms for the evolution of such additional cartilaginous structures have been proposed by Svensson and Haas : (1) through duplication of existing cartilages; (2) through partitioning of existing cartilages through the development of new joints; (3) through de novo evolution of cartilages not homologous to existing elements. In all three cases, one or more genetic regulators must be responsible for the evolution of the novel cartilage. Bapx1 (also known as nkx3.2and xbap) homologues are present in different, distantly related phyla. This gene was first identified in Drosophila, where it spatially subdivides the mesoderm and is thus essential for midgut musculature formation . In amphioxus and lamprey bapx1 is expressed in the pharyngeal endoderm [1, 7]. During pre-gnathostome evolution bapx1 is suggested to have been incorporated into an existing pharyngeal arch patterning system . In such a system, a gradual expression of homeobox genes defines an anterior-posterior axis. Overlapping expression of these genes defines different regions along this axis [8–10]. For instance, the first pharyngeal arch is defined by the absence of hox expression, whereas the second pharyngeal arch is defined by hoxa2 expression [11, 12]. Gnathostome pharyngeal arches are patterned dorsoventrally by a nested expression of dlx genes [13, 14]. These two patterning programs together form a developmental grid that enables locally restricted gene expression dependent on the specific spatial configuration. The incorporation of bapx1 into this pre-gnathostome head patterning program has been suggested to have played a major role in the evolution of the gnathostome jaw [1, 15]. 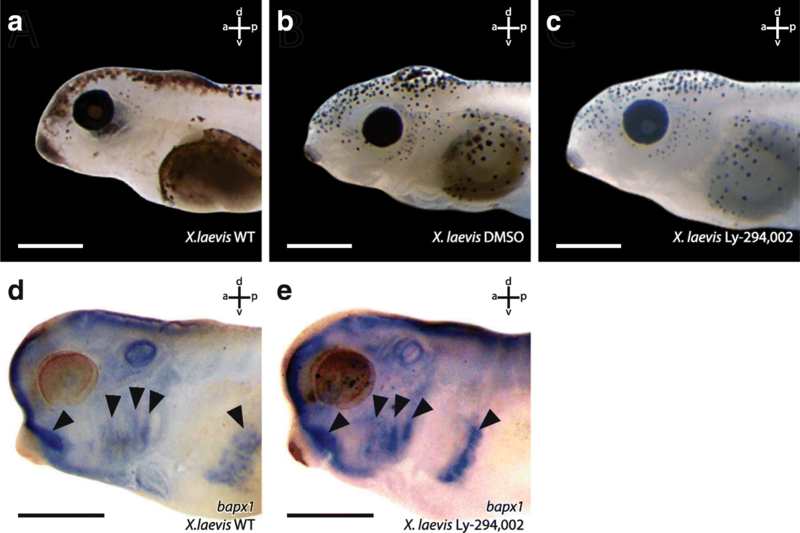 In lamprey, which lacks a dorsoventral patterning mediated by dlx genes, bapx1 is not expressed in the first pharyngeal arch, whereas in Scyliorhinus and zebrafish bapx1 expression dependent on dlx function within the first pharyngeal arch has been reported [16–18]. In zebrafish bapx1 expression can be found in an intermediate domain of the first pharyngeal arch and is ventrally restricted by a barx1 expressing domain [17, 19]. Barx1 expression is ventrally restricted by hand2 expression which inhibits bapx1 expression during development . In zebrafish bapx1 is expressed in the intermediate domain of the first pharyngeal arch, exactly where the primary jaw joint will form. Homologous genes with similar first pharyngeal arch expression can be found in Xenopus , Pleurodeles , chicken , mouse  and human . Bapx1 knockdown in zebrafish led to fusion of Meckel’s cartilage and the palatoquadrate, resulting in loss of the primary jaw joint . 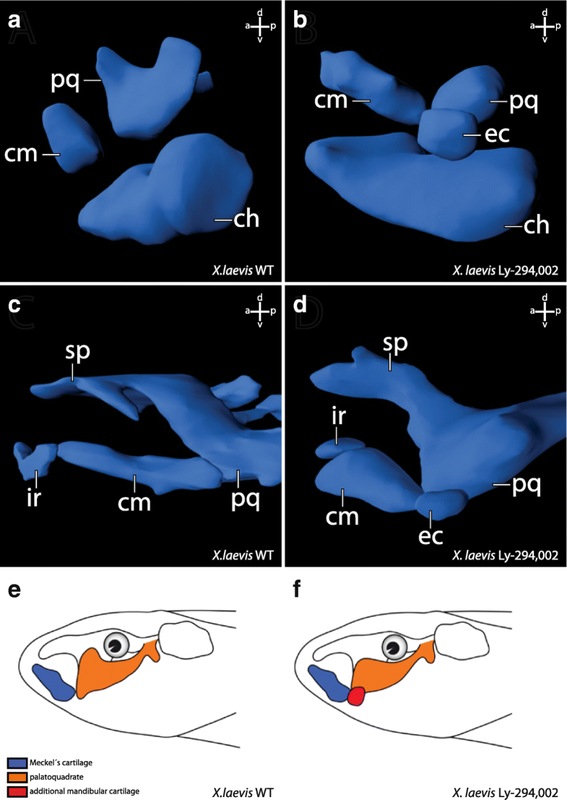 The same result is seen after downregulation of bapx1 in amphibians (Lukas and Olsson, submitted) indicating a role for bapx1 in both development and evolution of the primary jaw joint. Loss of barx1 function in zebrafish led to dorsal expansion of hand2 expression and the formation of an ectopic joint within Meckel’s cartilage where hand2 and bapx1 expression domains met . This ectopic joint development after barx1 inactivation and the following expansion of the bapx1 expression domain further indicates that bapx1 expression can induce joint development in the first pharyngeal jaw. The role of phosphatidylinositol 3-kinase (PI3K) in cell metabolism, regulation of gene expression, cell survival, and cell growth is well-documented [25, 26]. It has been shown that PI3K signaling can down-regulate bapx1 specifically by using the catalytic subunit p85β in mice . Pik3ca, the PI3K subunit responsible for the bapx1 suppression pathway, is expressed in X. laevis in the pharyngeal region from NF 26 to NF 32 . Ly-294,002 (2-(4-Morpholinyl)-8-phenyl-4H-1-benzopyran-4-one hydrochloride) is a specific inhibitor of PI3K . PI3K suppression mediated by Ly-294,002 causes elevated bapx1 expression levels . 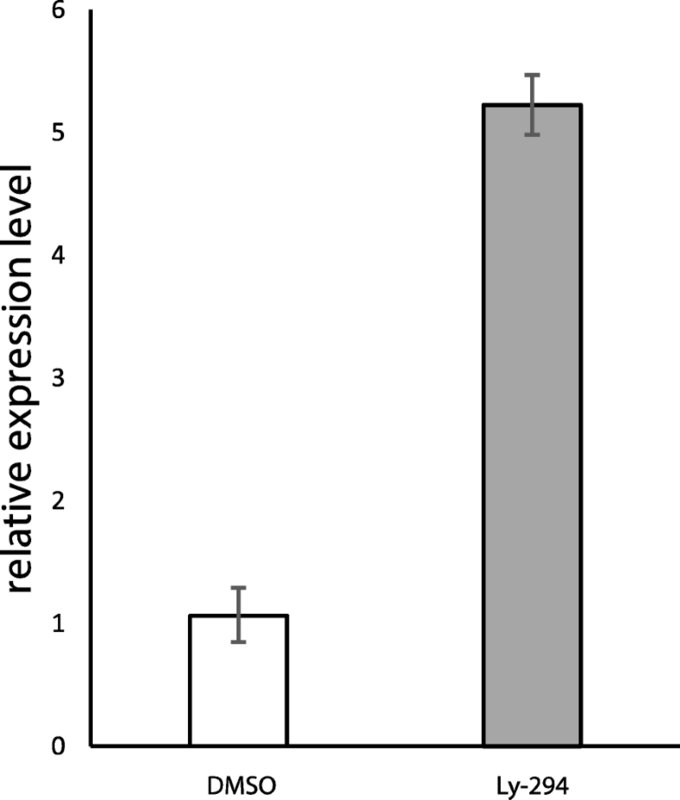 To test the effects of overexpression of bapx1 in the development of the first pharyngeal arch in amphibians, Ly-294,002 was used in this study to inhibit pik3ca function and enhance bapx1 expression in vivo. Males and females of Xenopus laevis (Daudin) and Ambystoma mexicanum (Shaw) were kept in separate groups in our breeding colony in Jena. Adults and larvae of Xenopus laevis were kept at 22 °C. To induce mating and obtain fertilized eggs Xenopus laevis adults were put pairwise into darkened basins with lowered water level. They were kept there over night at 16 °C. After successful egg deposition the eggs were collected and then dejellied using a solution of 2% cysteine hydrochloride. The eggs were washed several times and cultured in 0,1× modified Barth’s saline (MBS) with 50 μg/ml gentamycin at 22 °C. Ambystoma mexicanum adults were kept at 18 °C. Single pairs were transferred into basins with fresh water and ice was added to lower the temperature and induce mating overnight. After successful egg deposition and fertilisation the eggs were collected and manually dejellied using dissecting forceps. The eggs were cultured in 20% Steinberg’s solution with 50 μg/ml gentamycin at 22 °C. Developmental stages were determined according to Nieuwkoop and Faber , Ziermann and Olsson  for X. laevis and Schreckenberg and Jacobson  for A. mexicanum. Nieuwkoop and Faber (NF) staging was used for the identification of early developmental stages. For the description and comparison of the inner morphology of treated embryos Ziermann and Olsson staging (ZO) was used because this staging table provides more comparable stages during chondrification and initial skeletal development than does Nieuwkoop and Faber. Embryos of X. laevis were incubated with different concentrations of LY-294,002 hydrochloride (Merck) at different developmental stages. LY-294,002 was initially dissolved in dimethyl sulfoxide (DMSO). A stock solution containing 10 μM DMSO and 1 mM LY-294,002 was prepared and diluted with MBS to concentrations of 10 μM, 20 μM, 30 μM, 40 μM and 50 μM LY-294,002. 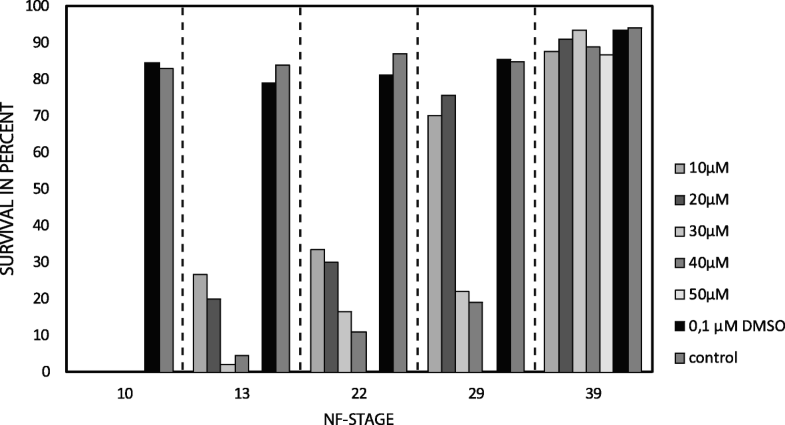 X. laevis embryos (N = 90 for each stage and concentration) were then incubated at NF 10 (onset of gastrulation), at NF 13 (onset of neurulation), at NF 22 (early tailbud stage), at NF 29 (late tailbud stage) and NF 39 (onset of cartilage development) in the different LY-294,002 dilutions. X. laevis embryos were also kept in 1× MBS and 0,1 μM DMSO in 0,1xMBS as a control. To specifically test the influence of LY-294,002 on mandibular arch development, 10 nl of 20 μM LY-294,002 was injected in the area of the mandibular neural crest segment  antero-ventral to the eye at NF 29. Injection was performed in 4% Ficoll/ 0,1× MBS and after 4 h the embryos were transferred into 0,1× MBS. A. mexicanum embryos were incubated with 20 μM Lys-294,002 at Schreckenberg and Jacobson stage (SJ) 36. X. laevis embryos were cultured until they reached NF 45 and A. mexicanum embryos were cultured for 5 days. The 0,1 μM DMSO and the 0,1xMBS solution as well as the different Lys-294,002 solutions were changed daily. Living, dead and malformed larvae were counted and images were taken using a Zeiss Stemi SV11 and an attached camera (ColorView) operated by AnalySIS software. Anaesthesia was performed using 1% tricaine methanesulfonate (MS-222) according to the animal welfare protocols at the Friedrich-Schiller-Universität Jena. Depending on further investigations larvae were fixed in 4% phosphate-buffered formalin (PFA), Dent’s fixative or RNA stabilisation reagent. PFA-fixed larvae were dehydrated and embedded in paraffin. Serial sectioning was performed using a rotary microtome (Microm, HM 355 S). Sections of 7 μm thickness were obtained and subsequently stained with Heidenhain’s Azan technique  or nuclear fast red staining . Images were taken with an XC10 Olympus camera mounted on an Olympus BX51 microscope operated with dotSlide software. X. laevis and A. mexicanum larvae fixed with Dent’s fixative was used for whole mount antibody staining. Cartilage cells were specifically stained with a monoclonal antibody against collagen II (II6B3-collagen II). A polyclonal antibody against newt skeletal muscle (12/101) was used to specifically stain muscle cells. For the colour reaction secondary antibodies conjugated with Alexa 488 and Alexa 568 (Molecular Probes) were used. The specimens were scanned with a confocal laser scanning microscope (Zeiss LSM 510) operated with Zen software. The image stacks obtained were further processed with Amira 6.0.1 (surface render) and Autodesk Maya® 2017 (rendering). Whole-mount in situ hybridisations were carried out according to the protocol in Harland (1991) with a few modifications described by Square et al. . NF 30–40 larvae were treated for 15 min and NF 40–45 larvae were treated for 20 min with Proteinase K. BM-Purple (Roche) was used for signal development. Probe of bapx1 was kindly provided by Jennifer Schmidt. RNA from whole embryos kept in 0,1× MBS, in 0,1 μM DMSO and different Ly-294,002 solutions was isolated using QIAzol Lysis Reagent (Qiagen) and purified using RNeasy Mini Kit (Qiagen) according to manufacturer’s instructions. RevertAid Transcriptase (Thermo Scientific) was used to synthesize complementary DNA from 2 μg RNA extracted from embryo. Quantitative PCR was performed using a Stratagene Mx3005P (Agilent Technologies) and one- step qPCR SYBR green kit (Roche). Sequences of primers used for amplification of bapx1 were taken from Square et al. . Target gene expression was normalized  to the expression level of histone H4 (5’-GACGCTGTCAACCGAG-3’and 5’- CGCCGAAGCCAGAGTG-3’). Initially embryos of X. laevis were treated with different concentrations of Ly-294,002 at different developmental stages. No embryos incubated at NF 10 survived the treatment with the different amounts of Lys-294,002 (Fig. 1). Embryos treated with 10 μM and 20 μM at the onset of neurulation (NF 13) survived the treatment at moderate rates (27 and 20% respectively) whereas only a minority of embryos treated with 30 μM (2%) and 40 μM (4%) survived. No embryo survived the treatment with 50 μM Ly-294,002. Survival rates slightly increased when embryos were reared in different Ly-294,002 solutions at NF 22. As before, no embryo survived treatment with 50 μM Ly-294,002. Larvae incubated at the late tailbud stage (NF 29) showed a much higher survival rate at lower Ly-294,002 concentrations. 70% of the larvae survived the treatment with 10 μM and 76% survived the treatment with 20 μM Ly-294,002, whereas no larvae survived the treatment with 50 μM. Larvae reared in the different concentrations of Ly-294,002 at the onset of chondrification (NF 39) show almost normal survival rates. No significant difference in the survival rate at the different developmental stages was observed between embryos reared in 0,1 μM DMSO and embryos reared normally in 0,1× MBS. Additionally, no abnormalities developed after DMSO treatment (Fig. 1). These circumstances indicate that changes in survival rate and morphology are not the result of the necessary presence DMSO in Ly-294,002 in vivo experiments and indicate a specific effect of Ly-294,002. The external morphology of all surviving X. laevis larvae from these incubation experiments was checked for potential morphological changes. We did not observe any external morphological or behavioural abnormalities in either control larvae, larvae raised in 0,1 μM DMSO or in Ly-294,002 treated larvae (Fig. 2a-c). We also checked for internal musculoskeletal changes. No such changes were observed in larvae treated with the different concentrations of Ly-294,002 at NF 10, NF 13, NF 22 or NF 39. Interestingly, larvae treated at NF 29 that survived this procedure developed changes in the mandibular skeleton. The highest rate of larvae with disturbed mandibular arch morphology was seen after treatment with 20 μM Ly-294,002 at NF 29 (Table 1). Of the larvae which survived the treatment, 57% developed an additional mandibular cartilage, whereas in larvae treated with other concentrations of Ly-294,002, lower rates of this mandibular arch phenotype were observed (Table 1). For further analyses, we used 20 μM Ly-294,002 and treated larvae from NF 29 onwards. At ZO 10 (NF 40–41) the palatoquadrate, Meckel’s cartilage and the ceratohyal were present in unperturbed larvae (Fig. 3a). In treated larvae an ectopic cartilage with a rounded shape was visible lateral to the palatoquadrate and Meckel’s cartilage. This ectopic cartilage was bordered postero-dorsally by the palatoquadrate and antero-dorsally by Meckel’s cartilage. The ectopic cartilage was separated from the two cartilages by a cavity-like gap (Fig. 3b). During further development the rounded shape and the location of the ectopic cartilage remained the same (Fig. 3d). At ZO 17 (NF 44) Meckel’s cartilage is normally sigmoidally elongated (Fig. 3c) but in treated larvae Meckel’s cartilage was shortened and thicker than in controls (Fig. 3d). The suprarostral plate bent more dorsally than normal and the muscular process had partly lost its dorsal projection in treated larvae. The area where the ectopic cartilage arose during development was nearly the same in all treated larvae. The changed morphology seemed to have no large effect on the behaviour because treated larvae showed normal feeding and respiration. Next, we investigated whether mandibular muscles displayed any abnormalities and whether muscles inserted onto or originated from the ectopic cartilage. We observed only two muscles which are affected by the Ly-294,002 treatment. The M. levator mandibulae articularis normally originates from the posterior-ventral surface of the muscular process of the palatoquadrate and inserts onto the dorsal surface of the posterior end of Meckel’s cartilage (Fig. 4a). In perturbed larvae the muscle originated more anteriorly from the muscular process of the palatoquadrate and inserted more laterally and anteriorly onto Meckel’s cartilage than in controls (Fig. 4b). The M. quadratohyoangularis normally originates from the ventral surface of the palatoquadrate and from the dorsal surface of the ceratohyal and inserts onto the ventro-lateral edge of Meckel’s cartilage (Fig. 4a). In perturbed larvae origination and insertion were similar, but the insertion onto Meckel’s cartilage was smaller than in controls. The dorsal portion of this muscle surrounded the ectopic cartilage, but not even a single fibre inserted onto or originated from this cartilage (Fig. 4b). To test if the development of mandibular ectopic cartilages is correlated with changes in bapx1 expression, we used quantitative PCR to investigate the relative expression of bapx1. We checked the expression levels for larvae reared in 0,1 μM DMSO, to investigate the effect of DMSO on bapx1 expression, and for larvae reared in 20 μM Ly-294,002 from 29NF onwards. Rearing larvae in 0,1 μM DMSO had no effect on bapx1 expression levels (Fig. 5 white bar). The unaltered bapx1 expression in tadpoles raised in 0,1 μM DMSO further confirmed that DMSO did not interfere with our experiments. The inhibition of PI3K mediated by Ly-294,002 treatment raised the expression levels of bapx1 more than fivefold (Fig. 5 dark grey bar). To further check for differences in the spatial expression we used whole mount in situ hybridisation of bapx1 transcripts. Normally, bapx1 was expressed in the ventral region of the mandibular arch at NF 37. The expression domain surrounded the cement gland dorsolaterally and marked the precursors of the palatoquadrate and the proximal part of Meckel’s cartilage (Fig. 2d). Posteriorly, bapx1 expression was visible in the endoderm of the pharyngeal pouches of pharyngeal arches 3–5. More posteriorly bapx1 was expressed in the foregut (Fig. 2d). In larvae treated with 20 μM Ly-294,002 from NF 29 onwards bapx1 expression was visible in the same regions as described for the control larva (Fig. 2e). No duplicated expression domain was visible. The expression domain in the mandibular arch was broader than in the control larvae and extended more posteriorly. Treatment with Ly-294,002 led to increased bapx1 expression levels and to an extension of the bapx1 expression domain in the mandibular arch. To investigate whether the observed cartilaginous changes in X. laevis are correlated to higher bapx1 expression in the mandibular arch, we injected 20 μM Ly-294,002 into the area of the mandibular crest identified by Sadaghiani and Thiébau (1987) at NF 29. In the Ly-294,002-treated specimen an ectopic cartilage occurred more posterior than in larvae reared in Ly-294,002 solution. Posterior to the primary jaw joint articulation, a dorsoventral elongated cartilaginous rod was visible at ZO 17. It seemed to comprise cells from the muscular process of the palatoquadrate, because the process was reduced in size and lacks the dorsal projection seen in controls (comp. Fig. 6a and b). The ectopic cartilage was embedded in connective tissue and no muscle inserted onto or originated from its surface. Furthermore, the ectopic cartilage was distantly located in relation to Meckel’s cartilage and the palatoquadrate and did not articulate with any of these cartilages (Fig. 6d). During further development, the muscular process of the palatoquadrate slightly extended its surface dorsally and formed a miniaturized process compared to unperturbed larvae at ZO 20 (NF 45–46; comp. Fig. 6c and d). The ectopic cartilages remained as dorsoventrally elongated rod-like structures lateral to the muscular process of the palatoquadrate. We have observed that Ly-294,002 treatment upregulates bapx1 expression in X. laevis, and that the treatment simultaneously led to the development of a mandibular ectopic cartilage. Next, we sought to repeat the experiments with another amphibian to test whether the obtained results are a consequence of the derived state of X. laevis or represent a common feature among amphibians. Therefore, we investigated the effects of Ly-294,002 treatment on the development of A. mexicanum. We treated A. mexicanum larvae at SJ 36, which approximately corresponds to X. laevis NF 29, with 20 μM Ly-294,002 and reared them for 5 days. As in X. laevis, no significant changes in external morphology were observed (comp. Fig. 7a and b). However, the cartilaginous structures of the mandibular arch were malformed in ways similar to the case in X. laevis. Postero-dorsal to Meckel’s cartilage and latero-ventral to the palatoquadrate an ectopic cartilage occurred in treated larvae (Fig. 7d). This cartilage seems to be separated from Meckel’s cartilage and the palatoquadrate and was rounded in shape. Ventrally, the palatoquadrate was broader and narrower than in control larvae (comp. Fig. 7c and d). Laterally it had lost contact to Meckel’s cartilage and only articulated medially with it. Meckel’s cartilage also forfeited lateral contact to the palatoquadrate and only articulated medially. The lateral side of the posterior end seemed to articulate with the ectopic cartilage. The insertion and origination of the different muscles required for proper jaw movement were not affected by the Ly-294,002 mediated bapx1 upregulation (comp. Fig. 7e and f). No such muscle inserted on the ectopic cartilage (Fig. 7f). High doses of the PI3K-inhibitor Ly-294,002 and incubation at early stages (beginning of gastrulation, beginning and end of neurulation) lead to dramatically decreased survival rates in treated specimens (Fig. 1). These decreased survival rates may be a consequence of the major role of PI3K in various developmental processes such as cell growth, cell differentiation and cell survival [25, 26]. High doses of Ly-294,002 at early developmental stages may restrict the function of PI3K in cell growth and survival which leads to premature death. When incubated at relatively low concentrations of Ly-294,002 the PI3K regulated key processes probably proceed normally, whereas the inhibition of bapx1 regulation remains disturbed. Between NF 29 and NF 39 the sensory organs develop, first muscle anlagen develop and differentiate into muscle fibres, the nervous system develops and excretory as well as digestive systems forms . Ly-294,002 treatment during this period and earlier has a very large influence on mandibular arch development. We have shown that treatment with 20 μM Ly-294,002 from NF 29 onwards significantly elevates the expression of bapx1 in X. laevis larvae using quantitative PCR. This upregulation additionally leads to a posterior expansion of the bapx1 expression in the mandibular arch primordia as visualized through in-situ hybridisation. Furthermore, we have shown that DMSO, which was used to dissolve Ly-294,002, has no effect on tadpole survival and does not influence bapx1 expression. The treatment with Ly-294,002 in X. laevis and A. mexicanum has an effect on the development of mandibular arch derived cartilaginous elements. Neither in incubation nor in injection experiments were morphological changes of the non-mandibular arch derived cartilaginous skeletal elements observed. In both species tested, an ectopic cartilage develops after Ly-294,002 treatment. This cartilage appears lateral to the palatoquadrate and postero-lateral to Meckel’s cartilage (Fig. 6b). In X. laevis it is clearly visible that the lateral projection of the palatoquadrate, the muscular process, is reduced after Ly-294,002 treatment (Fig. 6d). The location of the ectopic cartilage suggests that the chondrocytes which form the ectopic cartilage became separated from the palatoquadrate during early development. These separated chondrocytes together may have formed a new lateral condensation which developed into the ectopic cartilage. Normally the m. orbitohyoideus and the m. quadratohyangularis originate from the lateral edge of the muscular process, but their origin is not the ectopic cartilage which is assumed to be formed by chondrocytes from the muscular process. Instead, they originate from the small remains of the muscular process. The chondrocytes which form the ectopic cartilage might have lost the ability to attract muscle progenitor cells. Additionally, no muscle inserts onto this ectopic cartilage, which indicates that no identity shift has taken place that would cause a muscle to shift its insertion. In A. mexicanum chondrocytes which normally form the lateral part of the palatoquadrate and the postero-dorsal part of Meckel’s cartilage become separated during development and seem to form the ectopic cartilage after bapx1 upregulation. An indentation is visible where chondrocytes are missing at both Meckel’s cartilage and the palatoquadrate. Just as in X. laevis, no muscle originates from or inserts into the ectopic cartilage. In both species the ectopic cartilage appears to consist of chondrocytes that originate from existing cartilaginous structures. The mandibular arch derived cartilaginous structures, which are situated next to the ectopic cartilage, are reduced in size where they adjoin to the ectopic cartilage. We suggest that the ectopic cartilage cannot be characterized as a de novo developed cartilage, because Meckel’s cartilage and the palatoquadrate are reduced in size and developed altered shape after Ly-294,002 treatment, which indicates that the ectopic cartilage comprises of chondrocytes separated from these cartilages. The development of the ectopic cartilage as a consequence of the Ly-294,002 treatment is correlated to the raised bapx1 expression levels which are also caused by the Ly-294,002 treatment. Bapx1 expression is thought to be joint promoting in the mandibular arch . Normally, bapx1 function keeps the region between Meckel’s cartilage and palatoquadrate chondrocyte-free and enables the formation of the jaw joint. In perturbed specimens with elevated and expanded expression of bapx1, cartilage development was prevented within the muscular process of the palatoquadrate. The prevention of cartilage development led to the establishment of additional chondrocyte-free regions. Such a region separates numerous chondrocytes from their primordial cartilage. These chondrocytes can then condense and develop into a new cartilage. Thus, our results show that Ly-294,002 treatment led to simultaneous upregulation of bapx1 and development of an ectopic cartilage. Bapx1 may be able to prevent cartilage formation in a restricted area and this prevention might subdivide existing cartilages. We suggest that bapx1 promotes the formation of cartilage free regions within existing cartilages, which could lead to the formation of cartilage-free region within an existing cartilage and/or the formation of an ectopic cartilage. This function could be a foundation for the emergence of novel cartilages during anuran evolution, and it suggests that new cartilages can arise during development, and therefore during evolution, by subdivision of existing cartilages. It has been suggested that bapx1 was involved in the evolution of the gnathostome jaw joint. Bapx1 was co-opted into the first arch in gnathostomes and replaced barx1 in the ventral-intermediary region of the mandibular arch . Barx1 has been shown to repress joint formation and promote cartilage formation, whereas bapx1 promotes joint formation and represses cartilage formation . Thereby, barx1 function in the agnathan mandibular arch ensures that no joint develops within this arch. The replacement of barx1 by bapx1 and thus the expression of bapx1 in the ventral intermediary region of the mandibular arch might have caused the development of a joint within this arch in gnathostomes. This potential of bapx1 to prevent cartilage formation and subdivide existing cartilages might be the explanation for the evolution of additional cartilages in larval anurans. The larval anuran jaw consists of Meckel’s cartilage and the infrarostral in the lower jaw. The upper jaw is formed by the paired cornua trabeculae and a plate-like suprarostral. Both rostralia are unique in anurans but no bapx1 expression can be seen during development in the region of the rostralia or their respective precursors. Additionally, bapx1 knockdown has no effect on the formation of the rostralia in X. laevis (unpublished). Several anurans, such as Alytes obstetricans , Heliophryne purcelli  and Pelobates fuscus , have been described in which one or more paired additional cartilages develop during the tadpole stage. Their shape and location within the jaw is different in the different species. They can appear as dorsoventral proceeding rods lateral to the suprarostral cartilages, as in Pelobates fuscus (Fig. 8b), or as cuneiform cartilages ventral to Meckel’s cartilage and lateral to the suprarostral cartilage, as in Heliophryne orientalis (Fig. 8c). In both cases they are located laterally within the lower jaw. The ectopic cartilages in Ly-294,002 treated X. laevis specimen are also located laterally, but more posteriorly (Fig. 8d). Our observations on Heliophryne orientalis tadpoles have shown that both additional cartilages, the sub-meckelian cartilage and the adrostral cartilage, lack muscle insertion or origination. The muscle-free sub-meckelian and adrostral cartilages are similar to the muscle-free condition of the ectopic cartilages in A. mexicanum and X. laevis treated with Ly-294,002. Both the absence of musculature and the lateral position of the additional cartilages are shared similarities between the naturally occurring adrostral cartilages and the ectopic cartilages which develop after Ly-294,002 treatment. These similarities and the ability of bapx1, whose upregulation is correlated to the development of the ectopic cartilages after Ly-294,002 treatment, to subdivide existing cartilages indicate that changes in bapx1 expression (upregulation or a heterotopic shift) may have been the reason for the evolution of novel cartilages in the mandibular arch within anurans. Expression analysis of bapx1 in the appropriate species can be used to test this hypothesis. In the present study we treated two amphibian species with Ly-294,002, and found that such treatment increased bapx1 expression and caused mandibular arch-derived ectopic cartilages to develop lateral to the palatoquadrate in the larvae. The appearance of additional cartilages, which develop through separation from pre-existing cartilages, simultaneously to bapx1 upregulation supports the notion that bapx1 has a joint-promoting function. The putative function further substantiates a possible role for bapx1 in the evolution of the gnathostome jaw joint. Additionally, bapx1 function may explain the development of additional cartilages in the anuran jaw, which could be caused by overexpression of bapx1 or by a heterotopic shift of its expression domain. The development of the ectopic cartilages implies that subdivision of pre-existing structures through changes in the expression of a developmental regulator is one possible contributing event in the evolution of morphological novelties. We are very grateful to Katja Felbel for technical support and preparation of the histological sections. Sandra Eisenberg took care of the animals. The monoclonal antibodies against collagen II (116B3-collagen II) and newt skeletal muscle (12/101) obtained from the Developmental Studies Hybridoma Bank were developed under the auspices of the NICHD and maintained by The University of Iowa, Department of Biological Sciences, Iowa City, IA 52242, USA. Detailed comments by two anonymous reviewers on earlier versions of this paper are gratefully acknowledged. This study was supported in part by a grant from the Deutsche Forschungsgemeinschaft (grant no. OL 134/2–4 to LO) and the Studienstiftung des Deutschen Volkes (to PL). PL and LO developed the concept and design of the study. PL was responsible for the experimental procedures including Ly-294,002 experiments, whole mount in-situ hybridisation, immunostainings, qPCR, 3D-reconstructions and histology. Analysis and interpretation of the data mentioned was mainly done by PL, who was also responsible for the drafting of the manuscript and its final form. LO critically revised the manuscript. All authors read and approved the final manuscript. All animal experiments were carried out according to the animal welfare protocols at Friedrich-Schiller-University, Jena.